1838-1842 autograph album that belonged to Mary L. Woods, possibly of New York City, as three signers gave "New York" as their residence or place of inscription. 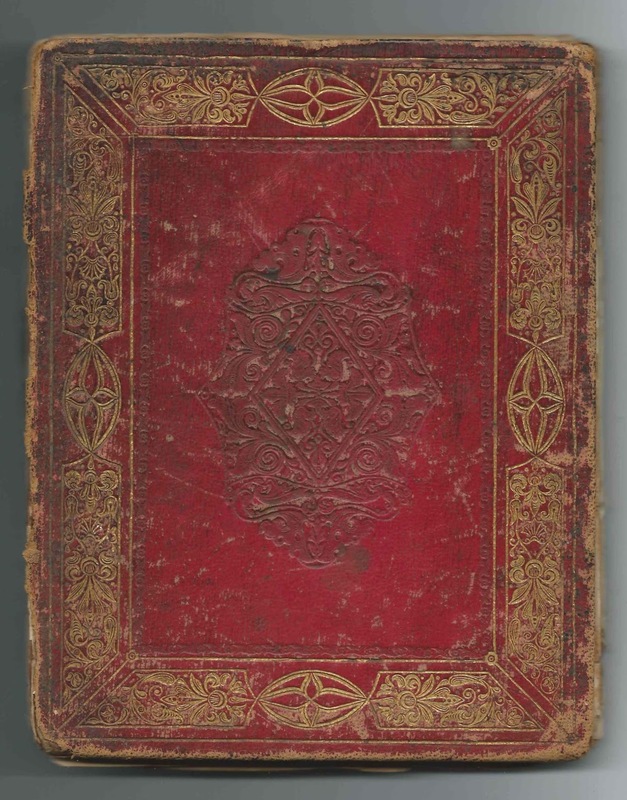 The album was presented to Mary in 1838 by Warren Timanus, presumably the Warren Timanus, son of Henry J. Timanus, who would die September 19, 1845 at the age of 27. 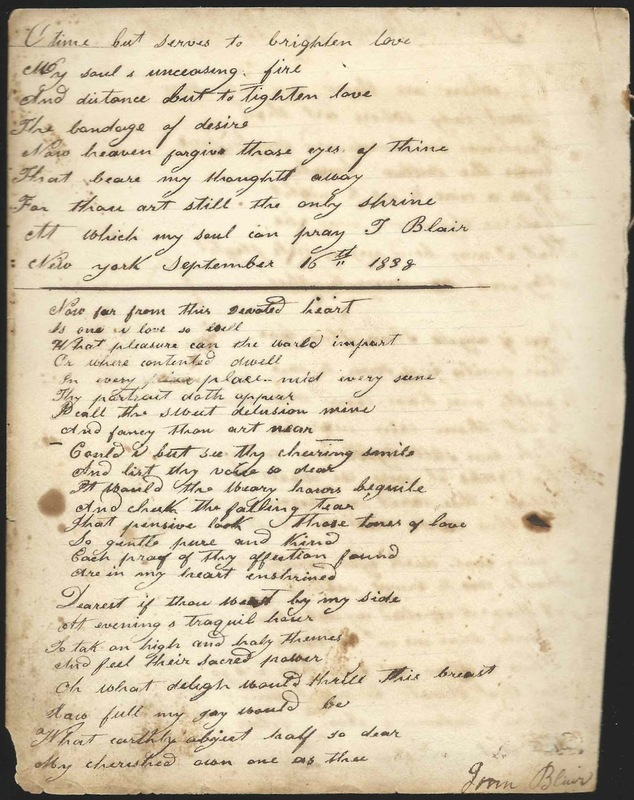 Warren inscribed a page near the end of the album on February 11, 1838. And he was likely the Warren T. who inscribed another page. The album, published by J. C. Riker of New York, is in fair to poor condition and mostly unbound. It measures approximately 7-3/4" x 6-1/4" and contains six engravings and about 55 inscribed pages. Several people inscribed more than one page. An alphabetical surname list and an alphabetical list of the signers, together with any personal information they offered, appear at the end of this post. The album is a frustrating one with ornate initials, pet names, and names that could have several different interpretations, some of which I'm sure I deciphered in error. If something sounds familiar to you, let me know, and I'll add the image. I haven't determined Mary's family. She may have married the John Blair who inscribed several pages, as one page bears the name Mrs. Mary Louisa Blair, though that Mary may not have been the album owner. John Blair inscribed a two-page sentiment, in addition to others. Two pages appear to have been written by Mary's sibling, but neither page shows a name. One page was inscribed by a Rosevelt, possibly T. Rosevelt or J. Rosevelt, on February 18, 1838. A Drake M ? S ? Arthur Gordon Martin  T ? B H McEnery T ? B ? H ? O T ? Pages had handwritten dates: M May 18, 1840; H August 1, 1840; C July 26, 1841. No name given.
? Anthony; initials possibly HL or HS or WL or WS or ? M. L. B.; perhaps Mary Louise (Woods) Blair? Mrs. Mary Louisa Blair; judging from what's written on this page, I believe that Mary L. Woods was Mary Louisa (Woods) Blair, wife of John Blair, who inscribed several pages in the album.
? Blair; given name initial possibly J or S or ?
? Conway; given name initial might be H or A or ? Charles Hay, signed on September 30, 18xx. Not sure of surname, could be May or Hoy or ? 2-1/2 page sentiment of Martin Luss or Luff or ? Initials, possibly L. B. M. or J. B. M.; also has name of John Blair. If J. B. M., possibly James B. Martin? J. B. M. or S B. M. or I. B. M. If J. B. M., possibly James B. Martin? H. Pratt; what look like a flourish could be a given name initial ? L. S. Teney; not sure of any element of the name. Warren T., signed in 1838; presumably Warren Timanus, who signed two other pages.